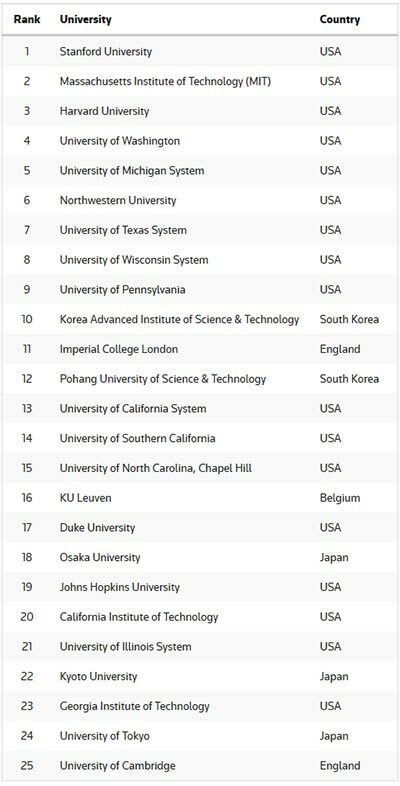 Reuters published its first world’s top 100 innovative universities ranking, building on a methodology that employs 10 different metrics. The criteria focused on academic papers, which indicate basic research performed at a university, and patent filings, which point to an institution’s interest in protecting and commercializing its discoveries. 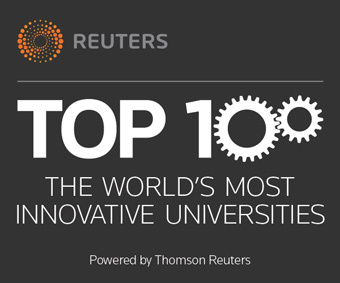 Leading the Reuters Top 100 is Stanford University. Located in the heart of California’s Silicon Valley, Stanford has earned a reputation as a hotbed for innovation in computer hardware and software: its faculty and alumni have founded some of the biggest tech companies in the world, including Hewlett-Packard, Yahoo and Google. A 2012 study by the university estimated that all the companies formed by Stanford entrepreneurs generate total global revenue of $2.7 trillion annually. Close behind are MIT and seven other U.S. universities, taking nine of the top 10 spots. U.S. institutions, in fact, account for 17 of the top 25. U.S.-based universities account for 50% of the Top 100. 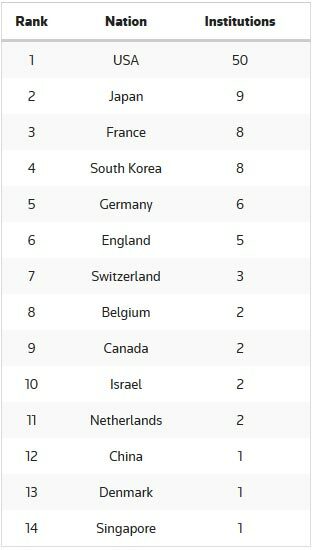 Japan is next, with 9%, followed by France and South Korea with 8% each, and Germany with 6%. The most innovative university in Europe, Imperial College London, ranked at No. 11 overall. Founded in 1907, it is relatively young compared with the continent’s second and third-place universities, Belgium’s KU Leuven (No. 16, founded in 1425) and England’s University of Cambridge (No. 25, established in 1209). Elsewhere in Europe, the nation of Switzerland stands out: With three schools on the list and a population of just over 8 million people, it has more top 100 innovative universities per capita than any other country in the world.